The Mall of San Juan stores have been reopening since Hurricane María hit last September. The Mall of San Juan is reopening this week. Taubman Centers Inc., owners of The Mall of San Juan, announced the shopping center will reopen at 11 a.m. Oct. 19. The center has been closed since Sept. 19 due to the impact of Hurricane María. “Our hearts go out to all of the residents of Puerto Rico during this time of difficulty. We are so grateful that our mall management team and their families are healthy and safe,” said Taubman Chairman Robert Taubman. Hurricane María caused interior water damage and affected the mall’s exterior landscaping and signage. The interior common area was “relatively unharmed,” the mall operators said. Taubman is installing large generators this week to allow the mall to operate autonomously if power continues to be intermittent, they added. 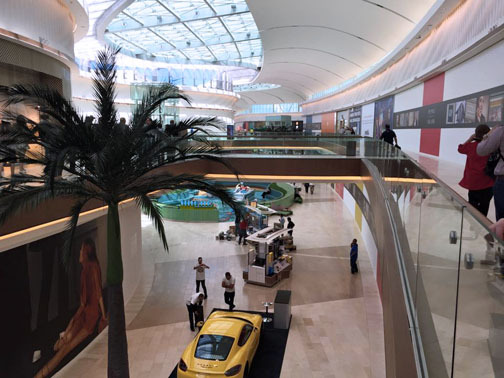 When it opens its doors, The Mall of San Juan will have an estimated 50-60 tenants capable of serving customers, with additional tenants opening in time for the holidays. Of the anchor tenants, Nordstrom recently stated that the company is in the process of determining how to rebuild and reopen its store as quickly as possible. Saks Fifth Avenue has not yet provided publicly an update on the status of the repair and reopening of its store. On Thursday, the mall will offer a “climate-controlled environment” during temporary operating hours of 11 a.m. to 5 p.m. daily until normal business hours are resumed. “We know there is a long road ahead for so many and we want to be of service and support,” he added. With the mall’s reopening, Taubman and The Mall of San Juan are kicking off a year-long community service program that will begin with donations to Unidos Por Puerto Rico, Cruz Roja Americana, ConPRmetidos, The Salvation Army and the Para la Naturaleza Community Fund. Other initiatives will be announced in the future. The collective efforts will result in more than $100,000 of cash and in-kind support for Puerto Rico. Hey Buddy!, I found this information for you: "The Mall of San Juan reopens Oct. 19, after month closed". Here is the website link: https://newsismybusiness.com/reopens-after-closed/. Thank you.